I’m getting pretty good at making cheesecakes. This one uses a Fudge Stripe cookie base for the crust, a ricotta-based cheesecake, and a strawberry topping, taking elements I used in three previous cheesecakes. The crust is nice and thick, with the perfect crunch to offset the smooth and creamy cheesecake plus a little chocolate from the cookies. I absolutely love the cheesecake using ricotta cheese instead of sour cream. 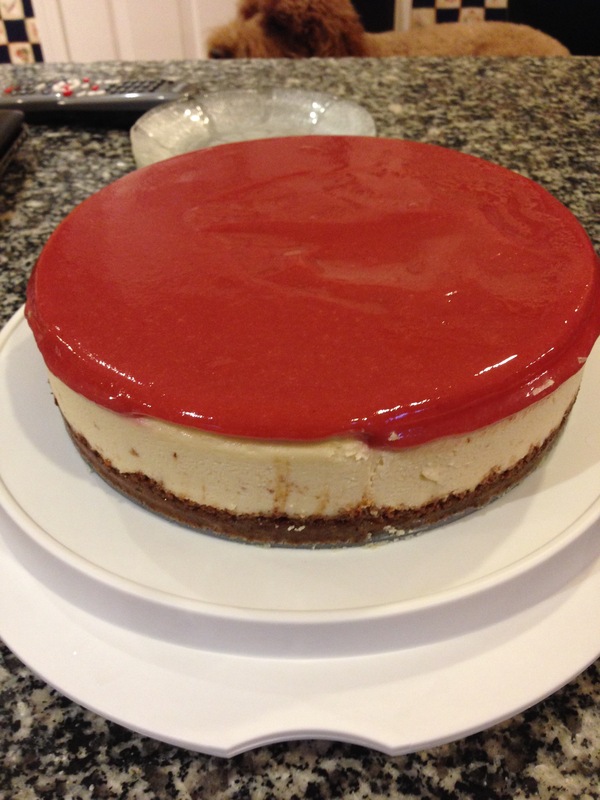 The strawberry topping is based on a prior recipe I made using raspberries instead and adds a very nice fruit element to cut the richness of the cheesecake. Based on recipes found here, and here. I used this springform pan purchased from Bed, Bath & Beyond. For the crust: Lightly butter 9″ springform pan (this all fit in a 9″, but 10″ would work too). Use Cuisinart food processor to blend cookies into fine crumbs. Melt butter and, in separate bowl, mix well into the crumbs with sugar. Pour the buttered, sugary crumbs into the springform pan, and firmly press the crumbs into the bottom of the pan (don’t go up the sides, it’s easier). Cover and refrigerate until cheesecake is ready. For the cheesecake: In Cuisinart food processor, beat softened cream cheese, sugar, and heavy cream until smooth (maybe :30 to 1:00 or less). Add in eggs, vanilla, and ricotta, and mix until incorporated. Pour into prepared springform pan. For the topping: Puree strawberries in a blender and pour through a mesh sieve a few times to remove as many of the seeds as you possibly can. This should make about 1 cup of strawberry puree.